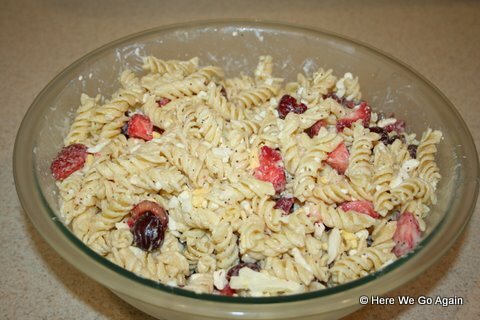 Cut up your fruit into pasta salad sized pieces. (If you put in grapes, I insist that you cut them in half. It is far too difficult to spear a whole grape with a fork.) Smaller berries can go in whole, like raspberries and blackberries. (Blueberries too, if you like them, I don’t really. Too…blue.) Chop your eggs or use an egg slicer. (I slice my eggs once and then turn it, and I get slivers.) Add two or three big spoonfuls of cottage cheese. Add the dressing and mix it together. If you are making ahead of time, I put the fruit in a separate container and leave the almonds on the side until I am ready to serve. Overnight, the colors from the fruit will leech onto the pasta and it just doesn’t look as nice. (Tastes fine though, so it depends who you are trying to impress.) And the almonds tend to get soft if left in the dressing overnight. This is the perfect summer salad and it is almost always what I bring to potlucks and picnics in the park.